This post will be a brief introduction to an ongoing project, currently in field data collection. As announced nearly a year ago, a small team, under the direction of Dimitri Nakassis (Toronto) and Kevin Pluta (Charleston), is involved with the documentation and publication of the palatial archives from the Palace of Nestor in Pylos, Greece. 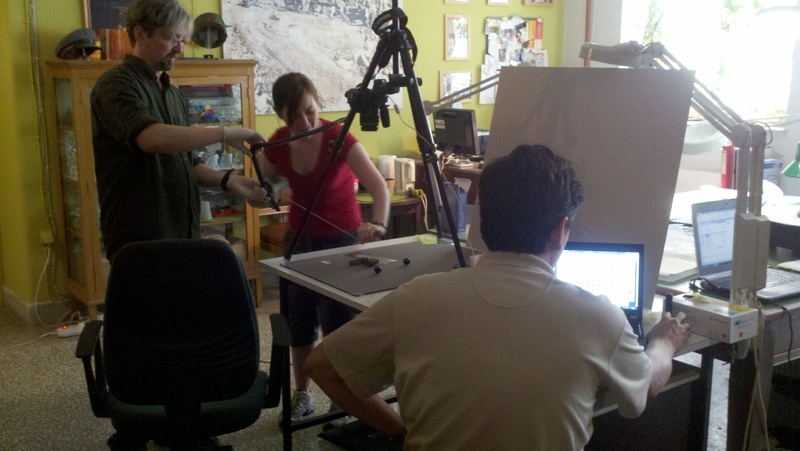 Beyond traditional documentation, including photographs, illustrations, and transcriptions, the team is using reflectance transformation imaging (RTI) and 3D white light scanning technologies to collect the highest resolution imagery and information to date on a Mycenaean administrative corpus. Kevin Pluta, Jami Baxley, and Dimitri Nakassis testing the RTI procedures. Linear B – the script used in these archives – is the oldest form of Greek known to man, and was used to record on clay tablets administrative activities of the Mycenaean political centers (ca. 1400-1200 BCE). As such, they provide incomparable information on the inner workings of one of the earliest complex state societies in the Greek world. The largest deposits of these tablets are from the Palace of Minos at Knossos, Crete, the Palace of Nestor at Pylos, and in the Bronze Age citadel at Thebes. While there were likely many more tablets in existence at the end of the Bronze Age, they have rarely survived because they were not intentionally baked. If the tablets were stored in a location that was not destroyed by conflagration, they could not survive until today. As a result, the tablets that have survived are that much more irreplaceable. The tablets from most of these deposits have received a full corpus publication. The Pylos corpus, which is one of two major Linear B corpora in the entire Aegean world, remains only partially published. The initial transliterations edited in the 1970s by Emmett L. Bennett, Jr., and Jean-Pierre Olivier still stand as the most complete publication of the corpus to date. The project will be collecting and compiling data to present the Palace of Nestor administrative documents in their entirety to the scholarly community, students of antiquity, and the broader lay community for the first time. The project will collate and organize the documentary system, synthesize transcriptions, and present the tablets in line drawings in 2D and 3D image formats. Beyond the objects as texts, the project will collect and collate data related to the objects as artifacts, including geochemical and geospatial information. Outputs consisting of a traditional print volume and an online companion are planned. Currently, the team, consisting of Dimitri Nakassis (Toronto), Kevin Pluta (Charleston), Jim Newhard (Charleston), Ben Rennison (Clemson), and Jami Baxley (Charleston), has completed the first week of a 4-week initial season. 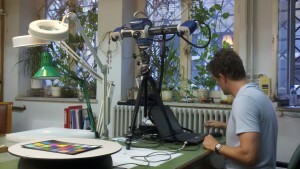 During this time, the RTI (aided by Hembo Pagi of the Archaeological Computing Research Group, University of Southampton) and 3D white light scanning (conducted by Rennison, Warren Lasch Conservation Center, Clemson) procedures have been tested and refined, and data collection is beginning to take up speed as instruments, researchers, and instruments find their groove. This entry was posted in 3D Capture, 3D visualization, Linear B, Projects, RTI, white light scanning and tagged 3D, Aegean Prehistory, Archaeology, College of Charleston, Digital Humanities, Laser Light Scanning, Linear B, reflectance transformation imaging, visualization. Bookmark the permalink.